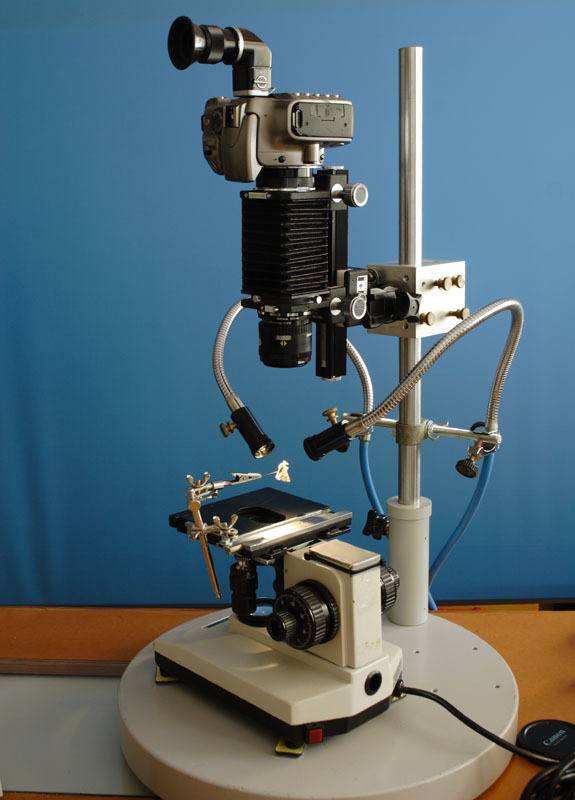 Coming from a long (but not deep) background in microscopy, I find more easy to setup a vertical rig using a microscope base that an horizontal one with all these nice (and strange for me) precision positioners and micrometers shown in some very nice and sophisticated arrangements from others more skilled members. Also, the gravity help to mantain some parts in place without the need of fixations. With limited budget and space, it's also convenient for me both to reutilize some materials and to be able to dismount and mount it easily. The camera is coupled with a custom made aluminium block and a Manfrotto monopod head. The bellows is a Pentax M42, coupled to the lens (in this case Apo Rodagon-D 75mm f4.5) with the adequate adapters and extension tubes. The microscope base was salvaged from an old school microscope, with a very nice coaxial focusing knobs (30mm total travel) and working X and Y controls. Clamped to the stage is an old articulated positioner. Two Dolan-Jenner fiber optic light guides are held in place with a custom adapter (a bicycle seat clamp and a long screw and both lab clamps. The camera is a Canon EOS, in the pictures a no working 300D. Detail of the specimen positioner and the polarizers at the end of the fiber optic guides. 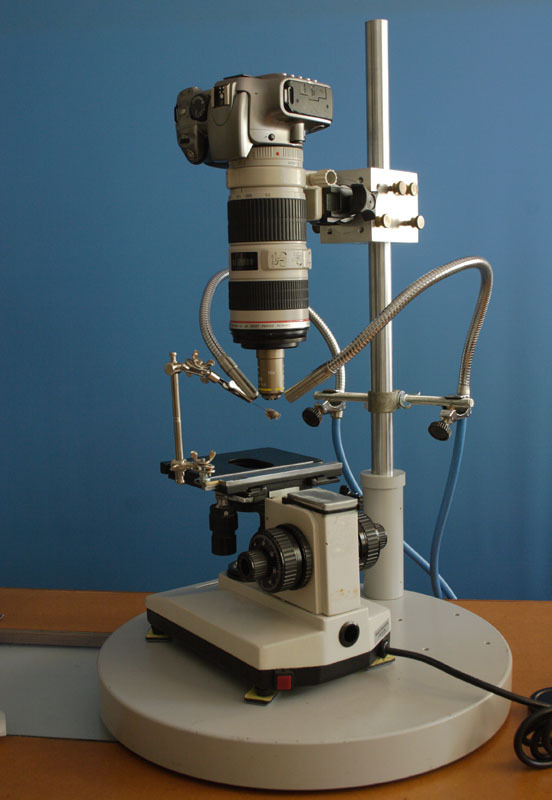 Whith this setup I place a microscope analizer between the microscope objective and the zoom for cross pol illumination. Any comments and advice very wellcome. This is an elegant setup -- I like it a lot! Coarse positioning from the vertical stand (and optionally the bellows rack), fine focus from a salvaged microscope, pivoting alligator clips for specimen holding. Infinity objective on telephoto lens gives magnification from 10X down to, what, 5X? Shown with dual fiber illumination but any other illumination would play well also. The heavy base could be replaced with a good enlarger stand or even a wood frame like I use with my screw table. Lots of ideas here for other people to work with. I've added a link to here, from the focusing FAQ. A very nice and functional setup. If you have the space and the funds, and if your camera has a HDMI output then connecting the camera to a HDMI TV or computer that accepts a HDMI input will make photography much easier. For stacking it makes it very easy to know when to start and when to stop. Very nice setup. I enjoy looking at these almost as much as looking at the pictures everyone takes with them. Did I mention I LOVE this forum? It delivers (aprox) 10X at 200mm and 6.9X at 150mm and 5.62 at 135mm, focused to infinity. Resolution and illumination are even up to 150mm, at 140mm there is some vignette but very usable for centered subjects when corners are no critical. When I had the time to perform a better test (resolution, comparations...)I will post it. A little short of funds...and now I need change my car , I had spent some money in microscope stuff and still shot with Canon EOS 20D and a 17"crt monitor (much better than cheap LCDs), but I urgently need a new camera (7D?, I'm a canonuser ), lens and computer... and of course a big and wonderful monitor. Sometimes I shot with a 50D with live view through USB and it's a real pleasure, no yet tested HDMI. Really nice, Pau! Your approach has an elegant simplicy that I admire; and it often takes a more work to solve challenges simply than it does to throw compexity at them. Way to go, too, for posting your rig. This kind of post helps us all. I like the fiber optic and the precision focus block of yor set-up, do you use any kind of light diffusion for your pictures? I would not recomend a 7D for studio stacks, why? because you will pay for features you do not need, like weather sealing and 18 AF sensor etc. Only for studio macro or microscope use, the 50D, 550D or even the 1000D will be equally adequate, but I do other kinds of photography, and the better sealing, viewfinder and autofucus of 7D are more atractive, and in special the feature (missing in the 60D) to do micro adjustements of the AF can be very important. 5DMkII is better for all but objectives with small image circle, but paired whith an standadard full frame zoom is too expensive for me, I can live whith 1.6 crop. Pau, if I may ask, what exactly are you using for your polarizer attachments (perhaps they also have concentrating lenses in them)? I'm aware of a few such attachments on the market--all seeming rather expensive for what they are--but I don't recognize yours. Am setting up now to do cross pol, so this is a matter of interest. Of course you can, it’s the essence of the forum! what exactly are you using for your polarizer attachments (perhaps they also have concentrating lenses in them)? I do this to cut off direct (specular) reflection, because direct reflection don't change the polarization plane, and diffuse reflection depolarize the light (or change the plane), so the crossed analyzer cuts the reflected pol light but allows to pass most of the diffuse reflected one. It's an alternative to highly diffused light. the colors are more intense, but any birrefringent materials like mineral dust particles and fibers are highlighted as bright spots. 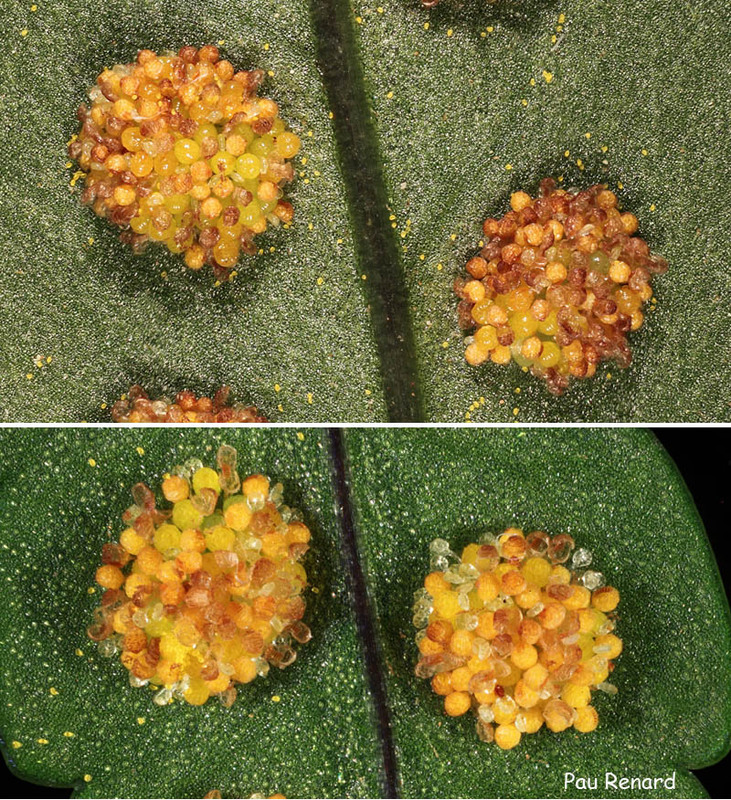 In my setups I use a high quality microscope analyzer (Nikon) and plastic inexpensive polarizers at the fiber optic ends. With better ones the effect would be a little better. Usually I don't use focusing lenses, but one time I placed them over the polarizers. The internal lens surface focused reflected ligth on the filter, and now I have a burned spot in the center of each one. To prevent it in the future I placed a heat (IR) cut filter (form a salvaged slide projector) between the bulb and the fiber optic inside the illuminator, and I'm going to order 2 new polarizers (likely form Edmund Optics), and the focusing lenses will be rear the filters. Here you have a comparison of the effect. 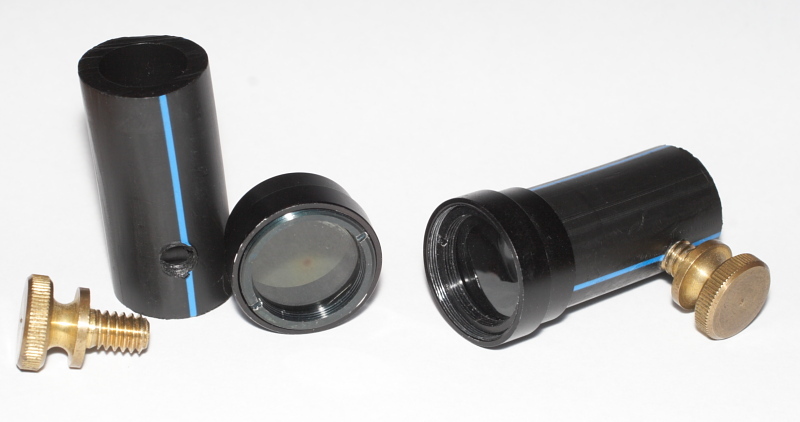 The upper one without polarizers and the lower one with cross pol. Please ask any other questions. Thanks, Pau. I'm pretty familiar with the uses and benefits of cross pol lighting, and am working on implementing it in my rig. 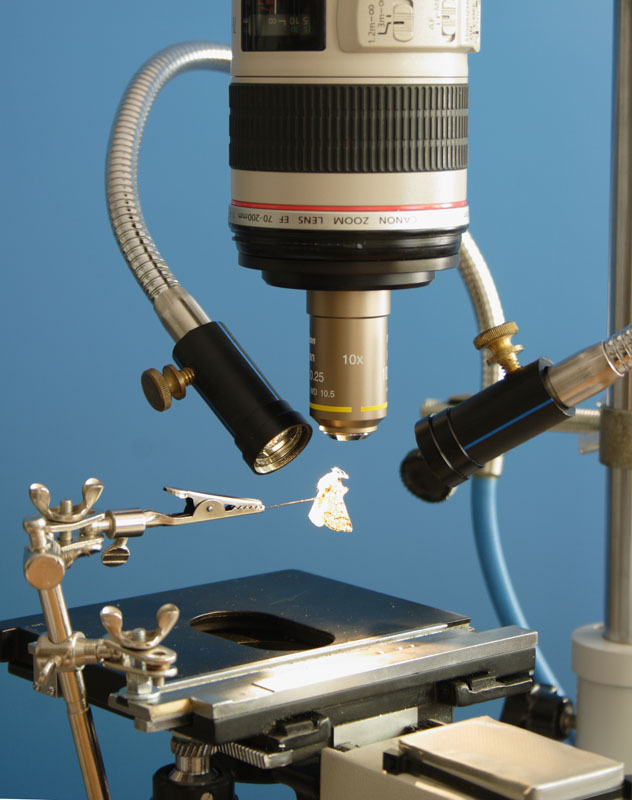 This why your approach is of strong interest to me--seeing how other people do things, and especially, hearing what went wrong (like the holes burning through your polarizers) is very helpful. I have an Olympus analyzer on order. I'm not sure yet how I'll mount it in the optical path of my horizontal rig. The easiest way would be to place it in a small lens tube with appropriate mounts on the front and back, and place this between bellows and objective. But more ideally, I'd like to be able to remove the analyzer for brighter focusing, and then put it in place without affecting the focus or position--which means not having to remove the objective. I'd love to put the analyzer between bellows and camera, but suspect that such a small polarizer would cause vignetting if placed there. Larger polarizing filters are of course widely available, but using an analyzer from a microscope assures me of appropriate quality for this purpose. In your setup, you apparently remove the objective mount to place your analyzer between objective and zoom lens. Does the analyzer simply fit in between and gravity holds it in place, or do you have some sort of mount for your analyzer? Interesting. I thought most illuminators already had pretty good IR filtration? What kind do you have? I have an old slide projector that I'll likely cannibalize for things like the IR filter for an illuminator that I'm making, but wouldn't have thought it necessary to add one to a factory-made unit. Any idea how you will mount the Edmund polarizers in front of the focusing lenses? I'm thinking of using Edmunds as well, with a bit of epoxy to affix each to a slightly oversized tube, and adding a thumb screw for tightening--rather like what you have apparently done here. Of course, that would mean loosening the screw for filter rotation, which I'd rather avoid. The adapters were made with a plastic plumbing tube, an old microscope filter holder and a screw. This is the part that most interests me, and any more details you care to provide may save me time when making my own. Your detail shot of the fiber optic ends with polarizers certainly doesn't look anything like something made from plastic plumbing pipe--nice work indeed. They looked like something purchased off-the shelf, and if so, I'd consider buying a set myself. - I don't see the need of remove the analyzer to focus, with fiber optic guides you may have enough light, and also be aware that removing the filter can change a little the focusing point (with non infinite objectives) and the smaller movement of the setup when doing that would also alter it . - Yes, the analyzer is just over the objective adapter and the gravity holds it in place, not convenient for an horizontal setup. What a macro rig, I love it! you say with this Canon you can down up to 140mm with good quality, zooms seem to have the entrance pupil further back than fixed, with the Nikon 105 i get a bit of vignetting but almost identical to the 105mm own vigneting wide open which sidetracked me a bit ... using lateral diffuse light the image show no problems! the resolution and the absence of lateral AC of this combo at 5.2X is spectacular! about polarizers I want to ask if you notice any reduction in CFI "blue halos" around brilliant areas, albeit as a "side effect" of reducing the intensity of the highlights.Seems that Zerene reduce it by "mixing" the shots especially in Pmax but if can be reduced by polarizers is a better thing! I imagine that ZS can get more textures to reconstruct a better image too... I do not know.